So, you’re a character in a movie, and you’ve just been in an action scene. You’ve been fighting off either the hero or the villain of the picture and mostly likely you’re on the run from the law? Or you have no access to a hospital or any sort of medical practitioner. What do you do? Your only option is self-medicating, whether it’s self-surgery, self-suture, bullet removal, etc. After some mondo action and bloodshed, John Rambo finds himself with an annoying piece of shrapnel embedded in his waist. Unfortunately, he’s without his trusty needle and thread, but he ‘MacGyvers’ a solution with a little gunpowder and a flame. Rambo carefully pushes the metal out of his body, then tears apart a bullet and (yikes!) pours the gunpowder into the open wound. He then inserts an enflamed twig into his body to ‘cauterize’ it. After the famous cabin shootout and escape from the white jumpsuit-wearing gunmen, John and Inspector Li venture into the woods to rest. 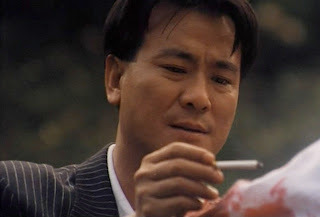 Li helps John fix the bullet wound on his arm with the same Rambo technique - opening up a shell casing, pouring gunpowder on the open wound and lighting himself on fire. Thank God for the twig John clenches in order to relieve the pain of having one's appendage partially exploded. Going back to 1970, Don Siegel's western Two Mules for Sister Sara may have been the first use of cinematic cauterization. 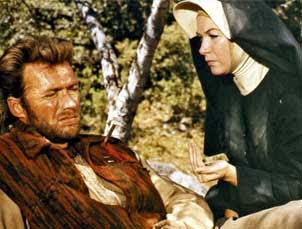 The unlikely heroic duo is Clint Eastwood as a mercenary and Shirley MacLaine as a nun, both travelling to Mexico to help in their revolution. After an attempt to blow up a train, Clint is shot in the shoulder with an arrow. But it's nothing a simple cauterizing technique of pushing through the arrow along with some lit gunpowder can't fix. After the Battle of York, that old Scottish dude, the elder Campbell played by John Cosmo, gets a nasty arrow in the shoulder. With some whisky to dull the pain, his fellow warring lads proceed to pull out the arrow, then blast the wound with a red hot poker. Ouch. In the setting of a penetrating trauma wound with a non-sterile object (arrow, bullet, shark bite), the major immediate concerns are hemorrhage and infection. Severe hemorrhage can be fatal within minutes while infection is more insidious, claiming victims within 72 hours. Cauterization in the Rambo sense of the word refers to the application of a heat source directly into the wound in an attempt to stem the blood loss and sterilize the region of any bacteria. Although theoretically attractive, this practice paradoxically creates more injury; even if large blood vessels are spared from thermal damage, layers of surrounding inflamed and necrotic tissue coalesce into an ideal medium for harmful bacteria to grow and spread. Anecdotally, cauterization may have been used with some measure of success prior to the availability of antibiotics and antiseptic surgical techniques (approximately 100 years ago) in rare circumstances. For example, in the amputation of a limb, the benefit of cauterizing the stump to control bleeding from large arteries, which was almost always fatal, exceeded the risk of dying from subsequent septic shock. Today, however, an individual forced to self-manage a penetrating injury in the absence of immediate medical care should instead focus his/her efforts on damage control. This is best accomplished by 1) applying continuous pressure to any accessible wound until the bleeding stops and 2) moving any dirty external debris and keeping the surrounding area clean with alcohol or boiled water. These simple measures may offer the best chance for survival until proper medical attention has been found. During the impeccably choreographed street shootout scene Moss manages to throw a hail of buckshot into Chigurh’s knee. When the opponents crawl away injured but alive they both have to repair their own damage before continuing on their journeys. Watching Chigurh direct the attention of the pharmacy staff away with a gasoline tank explosion outside makes us think that he’s done this before – scary. This allows the mop-headed villain to steal his tools and go about his business. While at his hotel room, the procedure of cutting off his pants, cleaning the wound, injecting painkillers into his injured knee and removing the bullet fragments is given squirm-inducing bold close-ups from the Coen Bros. I can’t even imagine how he would repair his broken arm at the end of the film. After a violent escape from the Sheriff’s office of Backwater USA, the soft-spoken former Green Beret, John Rambo, retreats to the woods fending off the ineffectual National Guard and local police. After falling 100 feet from a rock cliff, Mr. Rambo is left with a nasty slice on his arm. Since he’s alone out in the woods, suddenly that needle and thread kit, which always seemed useless in a compass, has a purpose. With precision we watch as Rambo sews up his arm, as the wound oozes out some wonderful blood squirts. Perhaps it’s not fair to use Terminator as an example because he’s technically a robot, but what the hell? With patient skill, James Cameron shows his Terminator perform some masterful surgery to his damaged eye. The grossest moment is no doubt when Arnie puts the scalpel into his eyeball, thus freeing it up for removal. Of course, Stan Winston’s animatronic special effects make it all look so real and gruesome, and nothing a handy pair of black sunglasses can't hide. One of the greatest fanboy scenes ever is Sam Raimi’s hilarious satire of Hollywood ‘montage scenes’. While fighting off the evil spirit that took control of his own arm, Ash ‘wins’ the battle by chopping off his own arm. This leaves our hero missing one appendage. No need to worry, as a trip to the tool shed will fix that. 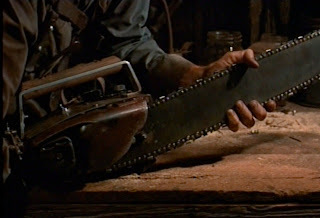 With a series of quick cuts we watch Ash construct his now-famous chainsaw arm out of scrap metal accompanied by his sawed-off boomstick. Groovy. Midway through Predator, Dillon and his overmatched commando unit manage to fight the Alien off. In a wonderfully edited sequence, once again realized by the master of physical and mechanical effects, Stan Winston, we get to see the vulnerability of the Predator for the first time. 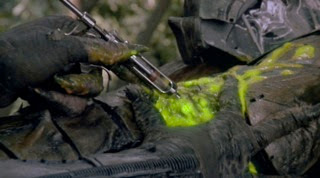 Alone in the trees, the Predator opens up a neat little first aid kit on his arm, which has just the right instruments to heal his nasty fluorescent blood-filled leg wound. The sequence is capped off with a loud bellow of pain, which reverberates throughout the jungle. 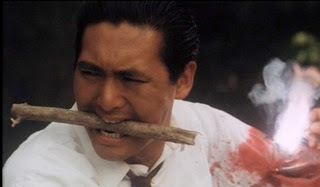 So think twice about emulating the methods used by these cinematic action heroes. Consult a doctor before performing any of these techniques.